[? ]Duc de Luynes, 1748-1793 (sale, Paris, Maison Bullion, 21 November 1793, lot 46). W... collection, Paris (sale, Paris, 17 February 1802, lot 44). Vicomte Aguado, Marquis de la Marismas (sale, Paris, 18-22 April 1843, lot 3). Cousin (sale, Paris, 20 December 1847, no. 41). Lady Beatrice Granard, née Mills (1874-1948, wife of Bernard Arthur Forbes, 8th Earl of Granard), London. The painter and printmaker François Boucher was one of the most prolific artists of 18th-century France. His pastoral and mythological scenes epitomize the frivolity and sensuousness of the rococo style. In this early work of 1732, Boucher depicts a beautiful country woman tending three charming, if slightly ragged, children. Alluring in her low-cut bodice, she is surrounded by food and utensils. 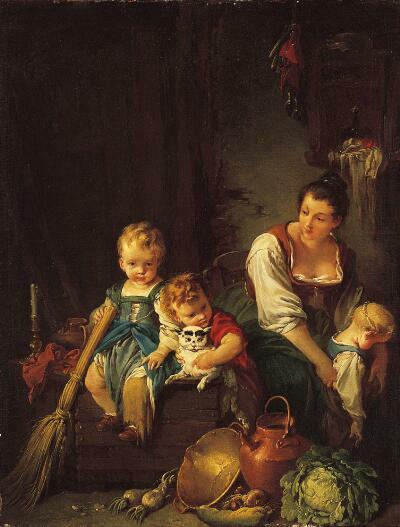 Boucher's light-hearted image focuses on the quiet domesticity and human interest of the scene. He suggests with little moralizing, that simple happiness is easily attained in modest surroundings. The picturesque arrangement of the interior, dark palette, and painterly brushwork recall the charm and intimacy of 17th-century Dutch genre painting. Boucher left his mark on both the fine and decorative arts. He created not only hundreds of paintings, but engravings, tapestry designs, ornamental boudoir panels, and book illustrations too. His sentimental, playful style was widely imitated, but fell out of favor with the rise of enlightenment ideas in the 18th century.